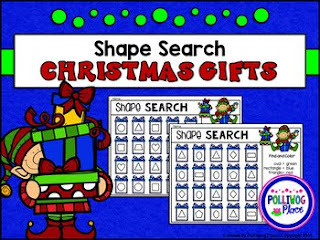 This Christmas Shape Search is an engaging way to practice identifying shapes. Each features 20 different shapes. Students search, find, and color each shapes according to the chart. Finally, they count and record the number of each shape. This is a low-prep activity. Simply print and go. You will receive 2 printable pages. Each page comes in both color and black lines. This shape search activity is great for independent work, early finishers, homework, and more!